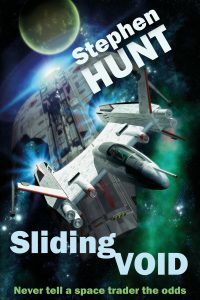 Today (Friday) is the last day that my scifi novella ‘Sliding Void’ is available free. I would extend the offer to run longer, but Jeff Bozos – the man from Amazon – he say, ‘No, Stephen, we cannot do this.’ Ideally, I would have run the offer over Christmas day, but it’s not possible, I’m afraid. You’ll be in good company as it’s been number one in the Kindle Book charts for most of this week! (1) Go to www.amazon.com/gp/kindle/pc and download the free ‘Kindle for PC’ software and install it on your computer. Use your existing email/password on record with Amazon (I’m presuming you have purchased from Amazon at least once before, here. – if not just set up a new account). (3) When you get your Kindle hardware from Santa on Christmas Day, as soon as you sign into your new ebook reader or Kindle Fire tablet, the free copy of Sliding Void will magically appear. Thanks to Mike on FaceBook for suggesting this tip to my currently Kindle-less readers!